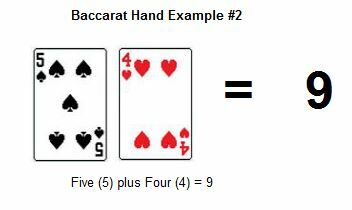 If you have read our guide to playing Baccarat or our Rules of the game sections then you will already be familiar with the hand values that apply in Baccarat. If you are not already familiar with how to calculate the value of the hands then we would encourage you to get to grips with the valuation convention that is used, as it is the key to understanding just what is happening at the tables and how the winning hand is determined. 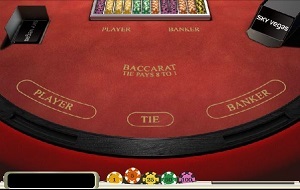 Again, just for clarity, when we are talking here about Baccarat, we mainly refer to the online version of the game that you will find in most online casinos. While this is more correctly known as Punto Banco or Mini Baccarat, it is widely referred to as simply Baccarat. The drawing rules and how winning hands are determined are the same in all those versions of the game, and the hand values are the same in all variations of Baccarat, but the way the game is played out will be slightly different depending on the version you are playing. All cards from Ace to Nine are valued at their pip count – basically the number you see on the card is the value assigned to that card. Aces are equal to One. The suit of the card – Hearts, Spades, etc. – does not matter and is ignored. Face Cards and Tens are valued at Zero. Face cards (called that because the picture on the card actually has a ‘face’ on it) are Jacks, Queens and Kings. All those are worth zero, as are tens. So, the hand you are betting on, either Player or Banker, will be dealt two cards. Ignore all Jacks, Queens and Kings, and Tens, as they are worth zero. If your hand is dealt two face cards then the hand has a value of zero (two zeros added toegther comes to zero). In that case the drawing rules will apply. To detmine the value of any hand, add together the points total of each card. If that total goes over Nine, then subtract ten. No hand can have a value of more than nine. That is the way the rules of the game work. So if the Player hand, for example, is dealt a 7 and a 9, you add those two cards together, which gives you 16, then subtract 10, which gives a total value of 6. Here are some examples to make it easier. Once you understand the basic concept then this is very easy to pick up. It will only take you a moment to understand how to value your cards. This hand looks nice, but it is only worth a total of 1 point. This first example hand has an Ace and a King. It looks lovely, and it would be a winning hand in BlackJack, (and a pretty good starting hand in poker) but unfortunately in Baccarat it is only worth a total of 1 point. 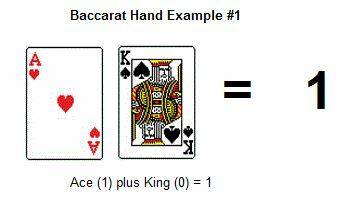 The Ace has a value of 1 and the King has a value of zero, for a total of 1. Under the Drawing Rules, if this was the hand dealt to the Player, then a third card would be dealt to it. A Four and a Five gives a total of Nine (9) which is nice and uncomplicated (and also a natural). This hand does not look all that great, but it is in fact a ‘natural’ and will win unless the other hand also has a total value of Nine. This example is not difficult at all to work out as it is simply adding 4 plus 5, for a total of 9. You might not like to see these cards when playing other card games, but in Baccarat this is as good as it gets. Another Natural! Zero plus Nine equals Nine. This hand not only looks good, but is also a great hand to be betting on. The King worth zero plus the Nine worth 9 totals 9. It would take a hand totaling 9 to tie with this, and no matter what the other hand gets dealt at worst this hand will tie, in which case you will get your stake back, so you cannot lose with a hand like this one. The King with a value of 0 plus the Ace worth 1 totalled 1, so a third card, a Nine, was dealt, bringing the toal to Zero. In this example, the first two cards totalled 1, so according to the drawing rules a third card was dealt. The third card, the sideways Nine, brought the total (0 + 1 + 9 = 0) to zero. This not not a good result if you were betting on this hand. Some online casino software will deal any third card to a hand in the above fashion, that is, sideways. Not all software does this. It is only to denote that the sideways card was the third card dealt, and doesn’t mean anything else. Some live casinos will also deal third cards this way. 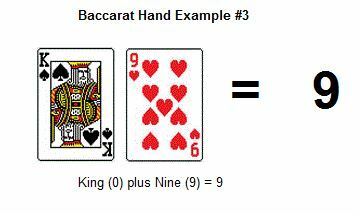 As you can see, there really isn’t much to working out the values of the hands in Baccarat. Just remember that you cannot go over Nine, 10’s and face cards are worth zero, aces are worth 1, and all other cards have their value printed on them.